I loved it. My first felting project went pretty well. 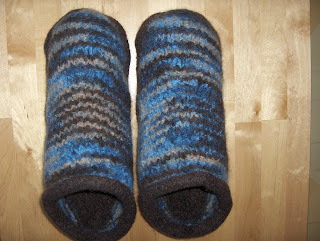 The Fiber Trends felted clog pattern is one of the quickest and easiest patterns I've knit up in my past year of knitting experience. They were a 3 movie knit and one of those movies was a foreign film. I'm a really slow knitter and a bit dyslexic reading patterns so if you're a quick knitter you could probably have these knit and felted in this time period. They're knit up on size 13 needles which seem really big after my Cardigan knitting. I picked up Patons Classic Merino Wool simply because it was the cheapest at the yarn shop I was in. I have a front loading washing machine which is great for energy efficiency but not so much for felting knitting projects. I babysat the dial on my machine for over half an hour worried it was going into the spin mode. I think a traditional machine agitates a bit more than my machine too. The cuff turned out exactly the way I wanted it while the main part looks like it needs a bit more. There are a few things I would do differently on the next pair. I would pay attention to how the colors were pooling if using a variegated color for the main part. One clog has a large area of brown right in the center and I would have liked the blues to be on this part. I would choose the plain sole vs. the "bumper" sole that I did on this pair. The "bumper" felted kind of weird and I think it would have looked alot better without this added feature. They're drying at the moment but I have a feeling I'm probably going to add some kind of "traction" to the bottom sole. I'll have to let you know what I come up with for this later in the week after I try them out on the wooden floors. 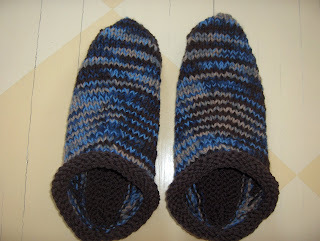 Now I kind of want to knit up more pairs in different colors. Ohh maybe needle felt a big C for Chicago Bear slippers. WooHoo a weekend knitting project! 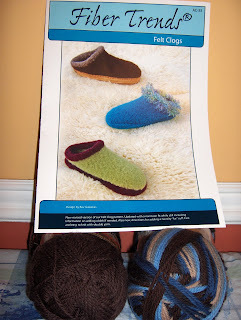 For some reason yesterday I decided I wanted to make a pair of felted clogs. 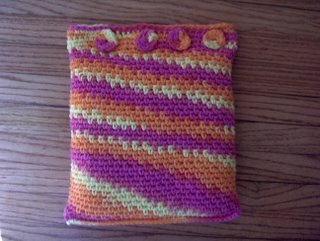 After checking several online retailers to attain a pattern I gave up. That is-until today. My LYS referred me to another yarn shop about 30 minutes away. When I gave them a call, they had 1 more pattern in stock and put it on hold for me. They didn't have the right sized needles but I'm going to see if I can "get by" with what I have. I'm excited to try out the "magic" of felting animal fibers. Yes I am a superfan. You know those crazy people who paint themselves in team colors and dance/shout/annoy non-superfans. (I draw the line at the dead bear heads and skins, that's just gross.) Right after the game on Sunday, I was actually wondering whether Tank Johnson could travel out of state because of the whole gun charges/probation thing. Yes, I am a bit involved with the team's happenings this year. Yesterday I looked into going to Miami. I really did. The cheapest flight and hotel was $700 each. I'm not completely crazy(ignoring husband's thoughts on this statement) so I'll be stuck here in Illinois watching the game. I have given a two week notice to my husband that WHEN the Bears come back home with their Super Bowl trophy I'll be in Grant Park with the other crazy superfans. I'm ready for the ticker tape parade baby!! On other news, I finished a project I started almost 2 years ago. I was impressed I remembered where it was and completed it. 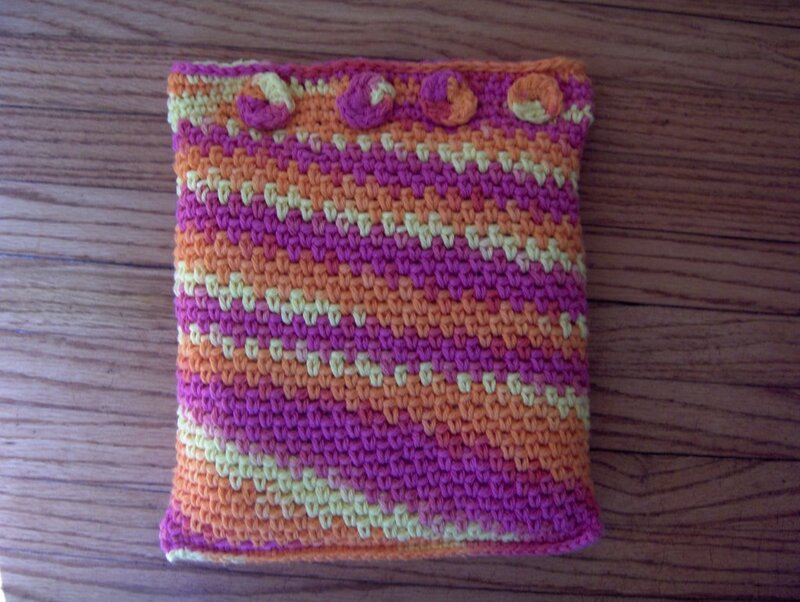 It's a crocheted comfort pack from Crochet Me Magazine. It's on it's way to my sister as a birthday gift. I started another one as the kids really wanted to keep this one. They don't realize it could take me another two years to finish it. I'm poking along on the Cardigan for Arwen. I have about half of it finished. It looks kind of strange with the left front, left sleeve, and the left side of the hood in one piece. I'm not sure how I like it yet. The only modification so far is adding a couple of inches to the length as the picture in the magazine looked really short. I'm finding that I really have to pay attention to where I'm at in the pattern. I lost track of where I was during a phonics lesson with my youngest and had to rip back about 20 rows. I've been spoiled with simple garter/ribbed/stockinette patterns. I have a pair of socks to work on for the football games/swim lessons/taekwondo classes. 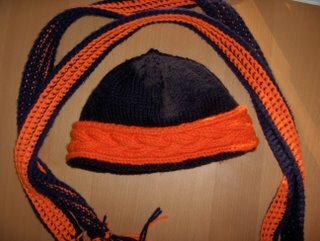 My blue and orange scarf and hat have been ready for months. One more game to go. Go BEARS!! I crossed out abuela and wrote in mamá. We're only 16 days into this calendar and so far it's been very amusing. Why didn't I pick one of these up last year? 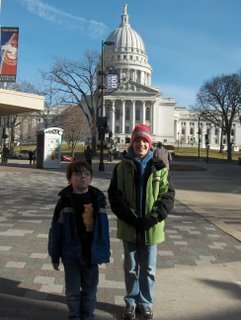 The kid's and I headed up to Madison, WI yesterday. It's a great city. This is a list of why so many people love living in Madison. It's January but you would have sworn it was July by the number of bikes on the roads. There is an extensive network of bike paths, routes, and lanes. People bike in the snow and ice here by adding chains to their bike tires. They even have a bicycle parking ordinance. When one wants to add a development they are required to add "X" number of bike parking spots according to this ordinance. They have a city bike at work program that allows employees of the city to "check out" a bike as an alternative to using their automobiles. It was hard to pick what we were going to do during the 12 hours that we had here. 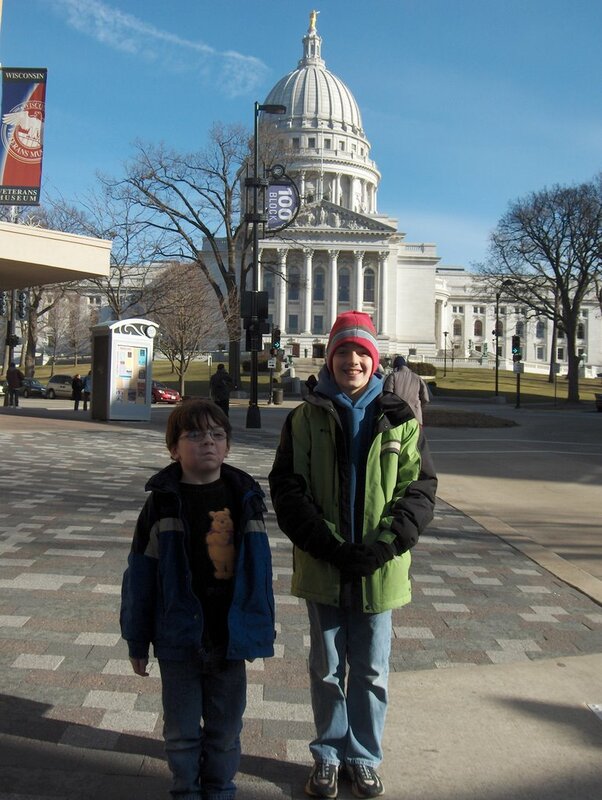 In downtown Madison they have what's called "the museum mile". There are 6 museums and galleries to pick from. Since I had 2 kid's in tow the logical choice was the Children's museum. It would have been fantastic a few years ago when the kids were younger but they still had a good time. We also checked out the Geological museum on campus. When I first heard of this I thought great a bunch of rocks to look at. This place was great. First off it's absolutely free. We picked up a self tour guide book at the beginning and worked our way around. They even had an entire section devoted to fossils where you could observe scientists uncovering dinosaur remains. It was really hard to pick a restaurant for dinner as almost every restaurant is veggie friendly. We ended up at Monty's Blue Plate Diner. They had tons of vegan/vegetarian options. Check out the menu here. The meat eaters and the veg head were satisfied and full upon departure. We arrived home well after midnight last night but I'm looking forward to heading back up to Madison in the summer and it's 70 square miles and escaping reality if only for another day trip. Alrighty then. I finally figured out how to get the Spanish ¿ and the accents to enter correctly. Thanks to the bookmarked site from hubby I can enlighten you on what the Spanish phrase of the day is from our new calendar. Lucky you? 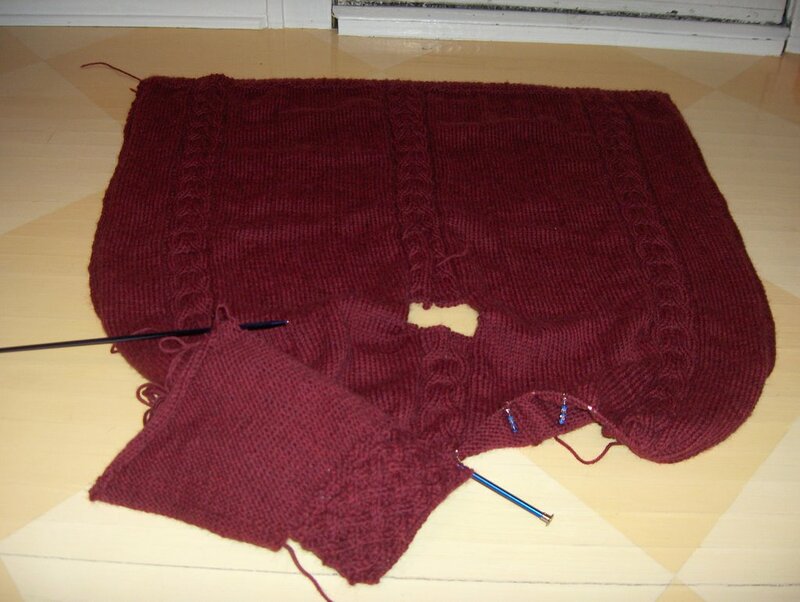 I've been wanting to start the Cardigan for Arwen from the Winter 2006 Interweave Knits magazine. (The link is from the knit along site. 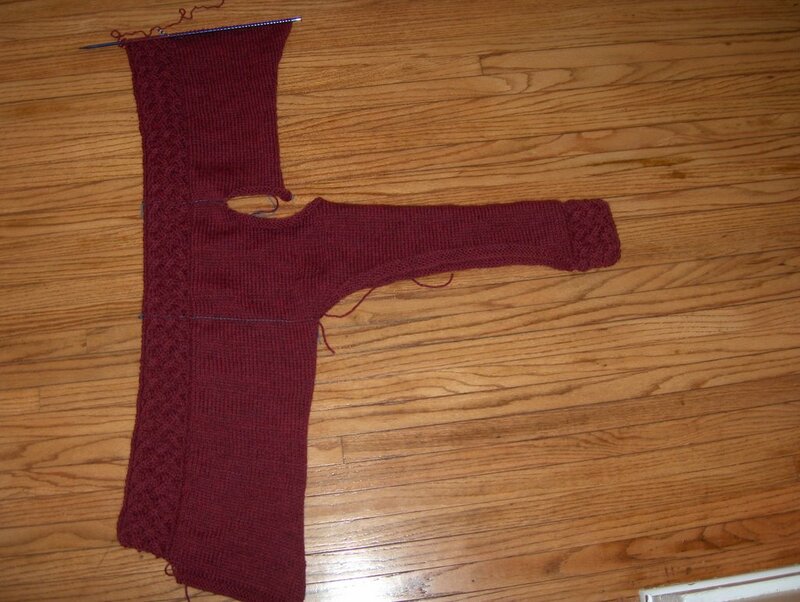 The Interweave Knits site was taking for blasted ever!!) The only problem was I didn't have the yarn to start it, or did I. I've been working on a cabled poncho that works up at the same gauge I need for the cardigan. I decided a couple of days ago that I would probably wear the cardigan more often than the poncho. The poncho is transforming into the cardigan row by row.